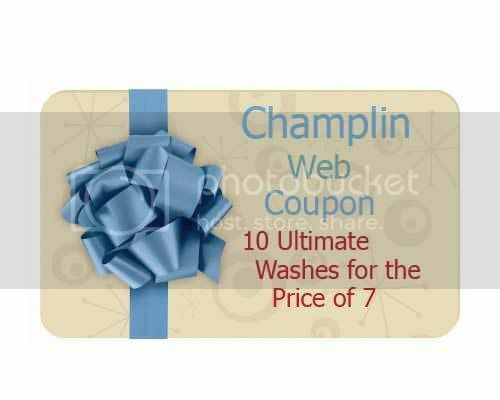 Champlin Auto Wash & Detailing Services - From Car Wash To Full Service Detailing, Champlin Does It All! Save time and money while protecting your business's fleet investment: We offer the best Fleet Car Wash and Detailing Plans! Ask about our VIP Wash Passes! The Ultimate wash, including engine compartment door jams and door rubbers. Remove tar specs and tough road grime. Interior shampoo extract all seats and floors including trunk and floor mats. Clean and add protectant dressing to all interior dash vents cup holders door panels door pockets glove boxes and door rubbers. Wax and buff polish exterior painted surfaces. polish has lasting qualities and clear coat U V protection for up to a year. Copyright Champlin Auto Wash 2009-2017. All rights reserved.